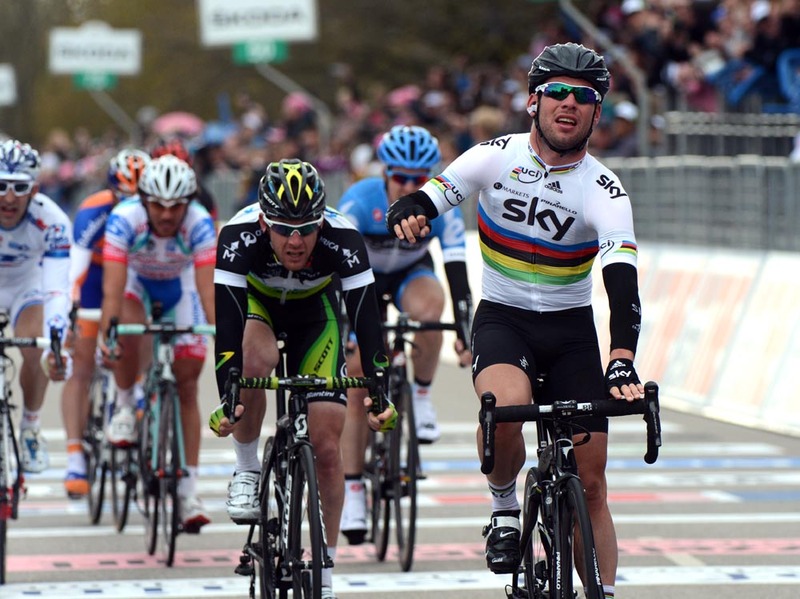 Mark Cavendish beat former team-mate Matt Goss to take stage two of this year’s Giro d’Italia in Herning this afternoon. The Sky rider looked unassailable as he took the eighth Giro stage win of his career to date; despite starting his sprint a long way out, Goss (Orica-GreenEdge) never looked like being able to come out of the Manxman’s wheel and had to settle for second. Historically, Cavendish has taken a day or two to find his sprinting legs in a Grand Tour. Before today, the only time he had won at the first attempt was in Brignoles in the 2009 Tour de France. Taylor Phinney (BMC) retains the maglia rosa despite dropping his chain 8.1km from the finish. The peloton had been nervous throughout the stage; a four-man escape group were reeled in uncharacteristically early (with 40km remaining), and Lars Bak’s solo bid for glory in front of a home crowd was also quickly responded to. There were a handful of crashes, too, but the GC favourites all appeared to survive unscathed. In a similiar way to which HTC-Highroad propelled Cavendish to two stage victories in last year’s Giro, Team Sky controlled the peloton for the final 15km. However, the world champion appeared to be in danger of getting boxed in the closing stages, and only good work from team-mate Geraint Thomas prevented that. And, after Alexander Kristoff (Katusha) and Theo Bos (Rabobank) crashed on the final bend while positioned towards the front of the peloton, Cavendish was easily the quickest of those few who contested for the victory. 10. Geraint Thomas (GBr) Team Sky all at st.